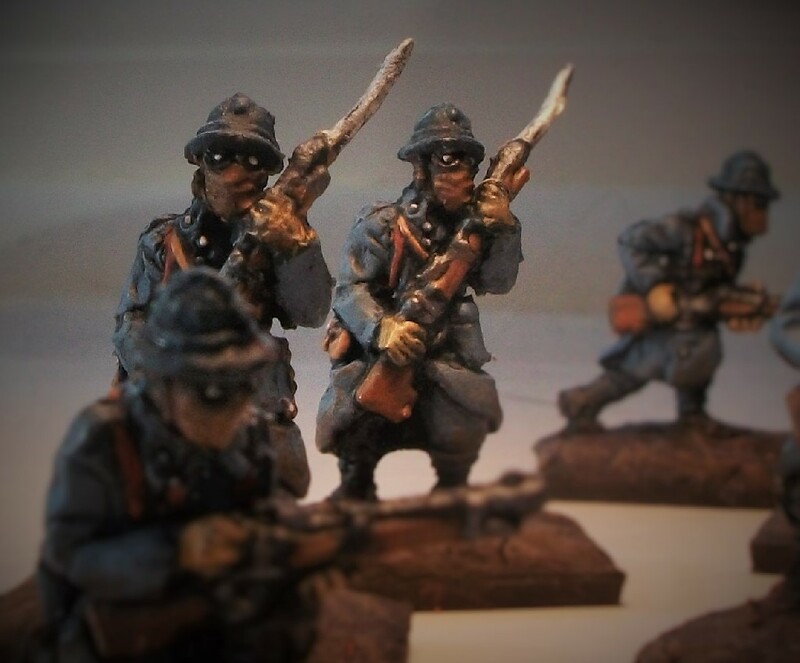 The first part of my Strelets Serbian infantry in Winter Dress are finished! 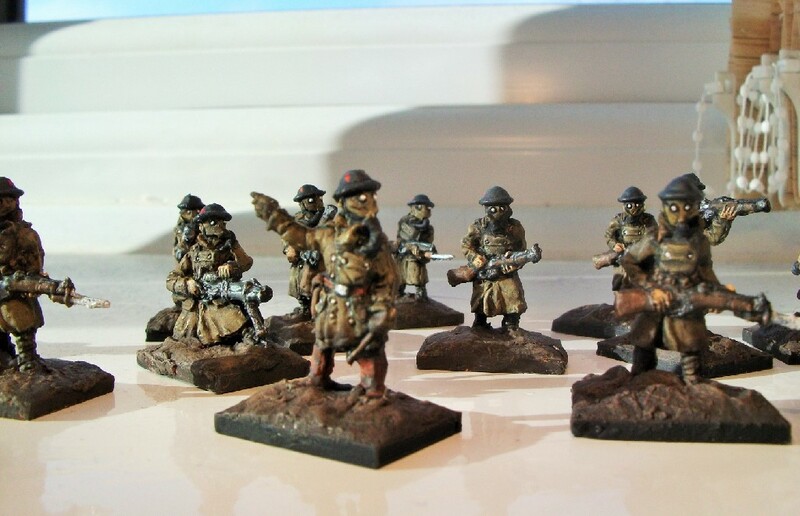 I’ve split the box into early war figures (1914-15) and later war figures (1916-18). The key difference is really just the French Adrian helmet instead of the Serbian traditional šajkača hat. 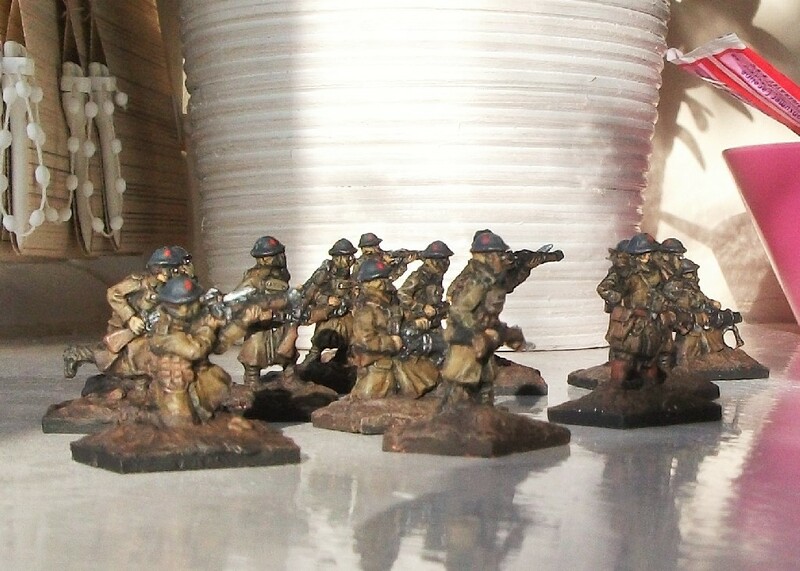 The late war figures will be next but the majority of these Strelets figures wear the šajkača and it’s these (of the 1st Ban / army) that I present below. I’ve based the figures in a landscape which has featured a dusting of snow, so possibly just prior to their epic retreat with Serbian citizens through the Albanian mountains with the winter snows on their way. Though some wear puttees around their lower legs, for the others I’ve tried to pick out in paint the classic Serbian peasant footwear, the opanci shoes with their horn-like endings to the toes. Likewise, I’ve added some colour to emulate the floral embroidery design often found on their thick woollen socks, the bright red colour of which symbolised the blood lost at the Battle of Kosovo in 1389 fighting the Ottoman Turks. Little of this is visible in the snow and grass – but at least I know it’s there, dammit! An experimental twist of the arm (above right) made for a more realistic pose for the grenade thrower than came off the sprue (above left), I think. However, the pose is clearly far better than the Plastic Soldier Review’s sour description of it being “the most unconvincing, flat and generally poor grenade pose we have ever seen”. 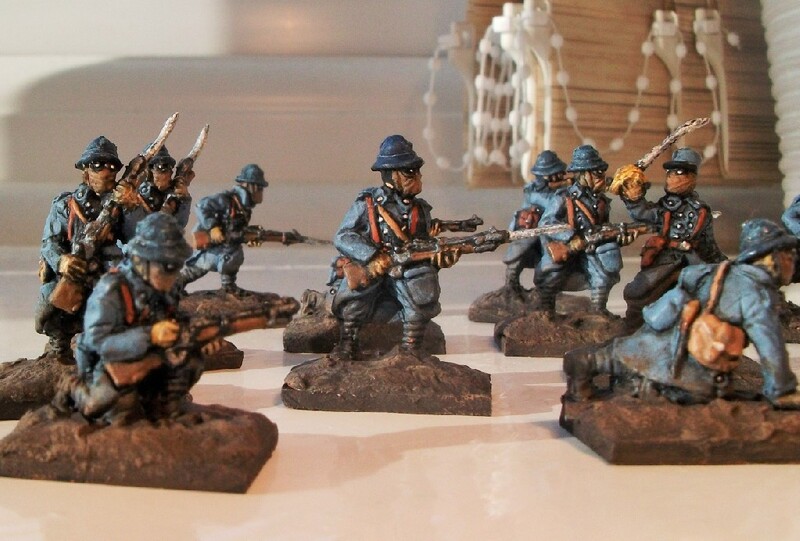 Plastic Soldier Review also had a bit of rant about the folly of Strelets depicting Serbian soldiers armed with Lewis machine guns, something they said would never have happened. Britain was an ally, so I’m happy to believe some examples may have gotten through. For example, Britain sent Rear-Admiral Troubridge with a naval force to help defend Belgrade, perhaps some examples accompanied that mission? Actually, that story about Admiral Troubridge is a fascinating one and I recommend reading the excellent Succour for Serbia: The British Naval Mission to Serbia in 1915. 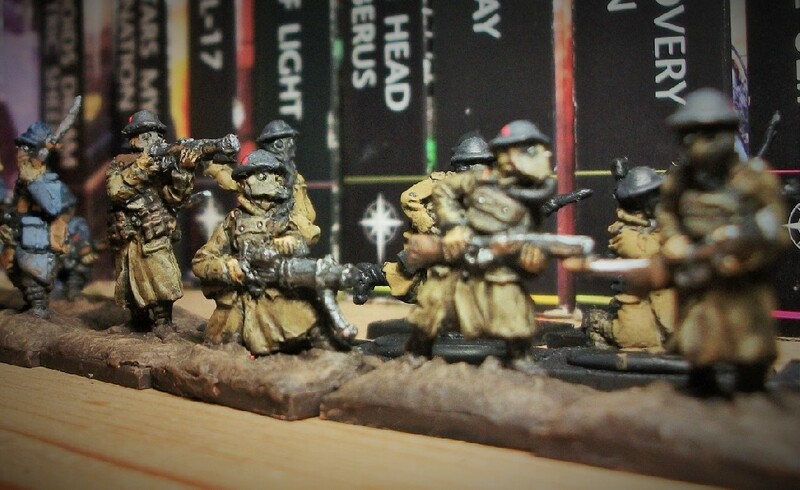 Anyway, I’ve trimmed one figure (above left) without the Lewis gun (which should keep PSR happy), leaving the figure vaguely gesturing instead. 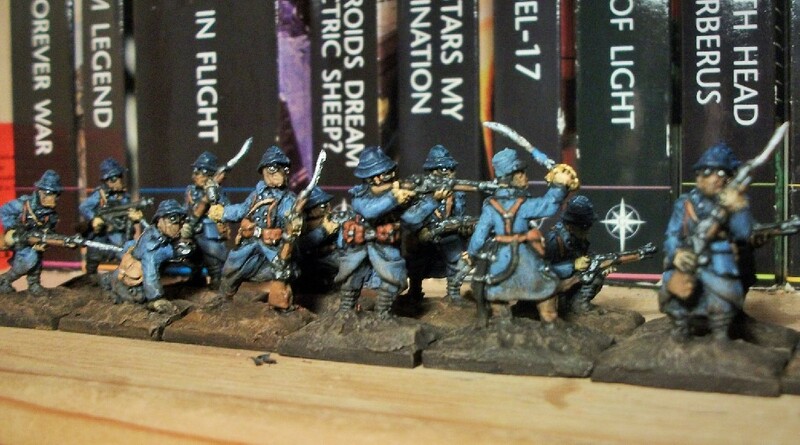 A little more trimming on the officers; those swords would have been a useless luxury on the battlefield, never mind the retreat through the Albanian mountains. One officer figure, therefore, I created sans sword and without a revolver either (above left) . They have ‘some colour’ to indicate the appropriate enameled tricolor cockade on their variation of the šajkača cap. I am really pleased that Strelets have now produced this under-represented but crucially important part of the Great War armies. The figures themselves are good and well proportioned. The only downside, I’d say, is that the faces lack a little of the crisp detail and character so familiar to early Strelets sets. 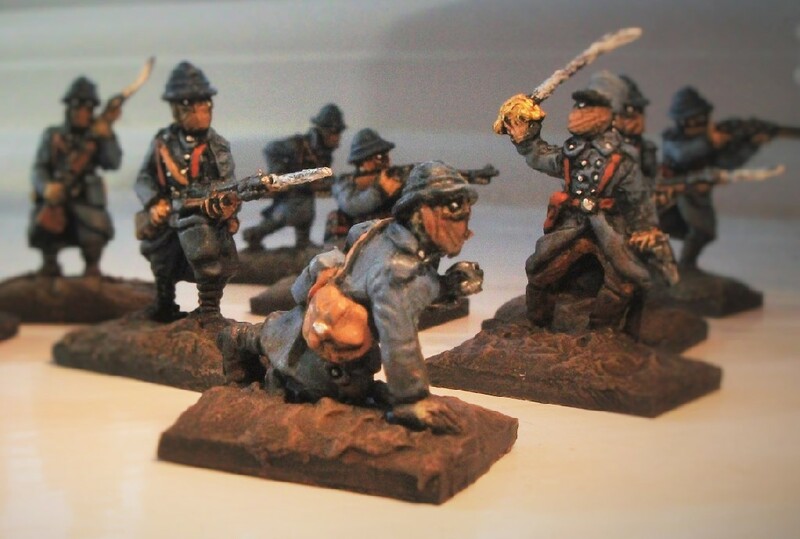 But that’s a quibble; I think these early war Serbs make for a great first set of figures for my 2018 WWI Project. I received some interesting information yesterday regarding the brother of my paternal grandmother. This man, John Neal, was part of a family tree recently researched by my mother and going as far back as his namesake, another John Neal(e) born in 1654. The John Neal that caught my attention had apparently died on 25th September 1915, as Lance Corporal J T Neal of the 2nd Battalion, Leicestershire Regiment. I did a little on-line research and noticed that the date of his death coincided with the first day of the Battle of Loos. Further research confirmed that the 2nd Battalion of the Leicestershire Regiment was indeed part of the attacking force (see below) and I assumed that he was one of the casualties of this battle. You will notice that he was part of the Indian Corps, Meerut Division, “The Garwal Brigade” serving alongside Gurkhas and the commander was a Brigadier General Blackader. Leicester has a long shared history with India, the city today being home to a large Indian population. The regiment’s nickname “The Tigers” is a reference to the considerable time it spent in India. It seems that this connection continued into the First World War. The Garwhal Rifles, the 8th and 9th Gurkhas all remain Indian army regiments to this day. British machine gunners in action at Loos, 1915. The Battle of Loos (pronounced loss in French) was a terrible slaughter for the British army. The French pronunciation of “Loss” here seems somehow grotesquely appropriate to anglophones for this dreadfully wasteful encounter of human life. The battle was notable for being the first time that the British deployed poison gas. It was also a test of Kitchener’s new volunteer army (“Lord Kitchener Needs You”) and I suspect that my relative John Neal could have been one such volunteer. Ghostly figures of British infantry advance through a gas cloud at Loos, 1915. Photograph believed to have been taken by a soldier. So, I therefore assume that my ancestor was killed at some point during the day’s fighting at Pietre, drawing German troops away from the main action at Loos. Ironically, even the slaughter at Loos itself was only really another supporting action to the large French attack in the 3rd Battle of Artois. Such was the scale of the mass killing on the Western Front. The Guards Cemetery, France, where my ancestor is buried, very near to the Great Cross visible in the background. Lance Corporal Neal’s is buried in the Guards Cemetery, Windy Corner, Cuinchy in northern France. This cemetery is on a site once used at the front as a dressing station and HQ by the army (near to a crossroads known to the British as Windy Corner). Written in red pen on the interment sheet, 2 / Leicestershire Regt, No.8666 Neal, Pte J. He lies next to a Lt of the Royal Irish Rifles who was apparently belatedly identified. Plot IX, Row G. No. 5. – right in front of the Great Cross. Like many soldiers, his body was exhumed from elsewhere and moved to be consolidated with others in the Windy Corner cemetery early in 1920. When he was taken from the original location, the means of identity was listed as being a ‘disc’. It sounds like his identification was fortunate as most others appearing on the same reburial form, and therefore alongside him in the cemetery, were listed simply as being “unknown soldiers”. It seems quite a pleasant spot, John Neal’s grave, surrounded by fields and trees. It would be nice and very appropriate to visit one day, I think. My humble camera is never the best but hopefully these photos are adequate. 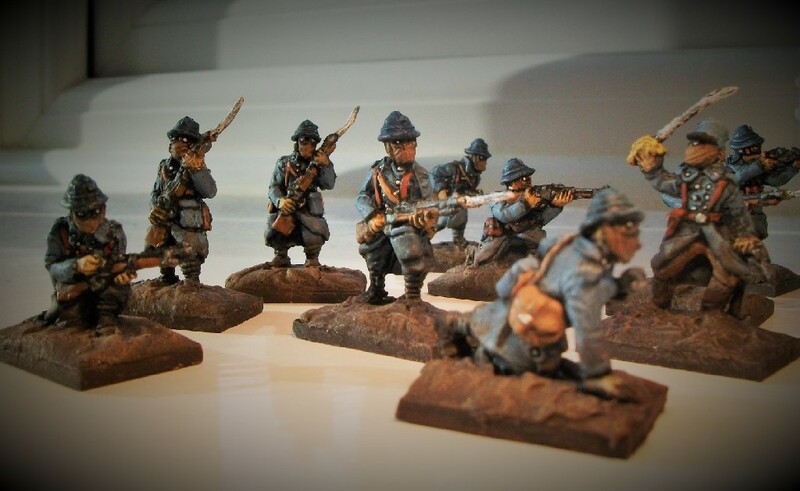 One of my little projects on the go is the painting of some WWI Strelets sets. 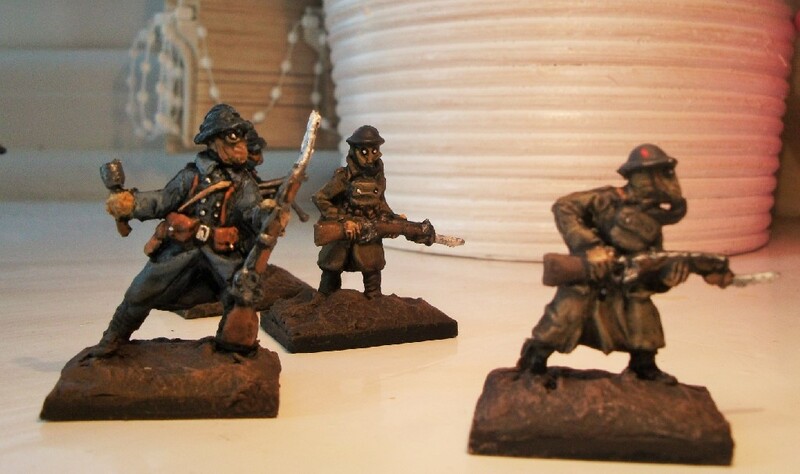 In particular these are the sets featuring most of the primary combatants in gas masks. In seemed timely to begin these sets for a number of reasons. Firstly, it’s the centenary of the beginning of that terrible conflict. Another reason relates to my own Great Grandfather on my mother’s side Harry Bennett, who enlisted in the Leicestershire Regiment. 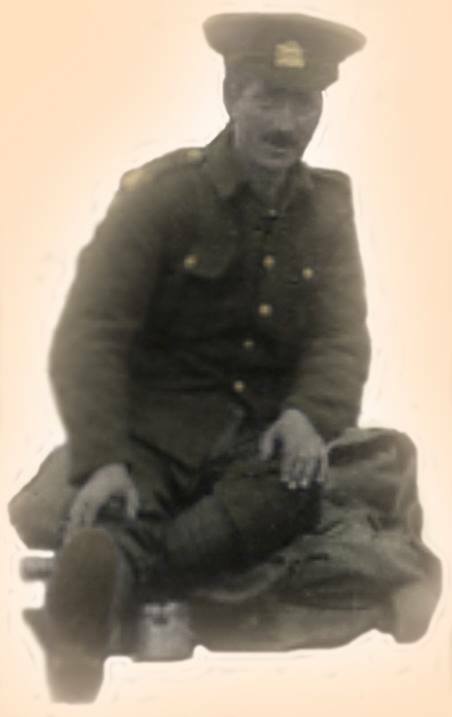 My great-grandfather, Private Harry Bennett, Leicestershire Regt, 1914-18 war. He was a victim of gas attack in the war and, although he survived and was invalided home, it seems that both his physical and mental health were broken by his experiences and he tragically ended his days in an asylum. I’ve never forgotten that and maybe that’s part of the reason I’ve steered clear of 20th century conflicts in my work: they’re a little too close to home. Whichever type was used, to be gassed was a truly horrible experience. 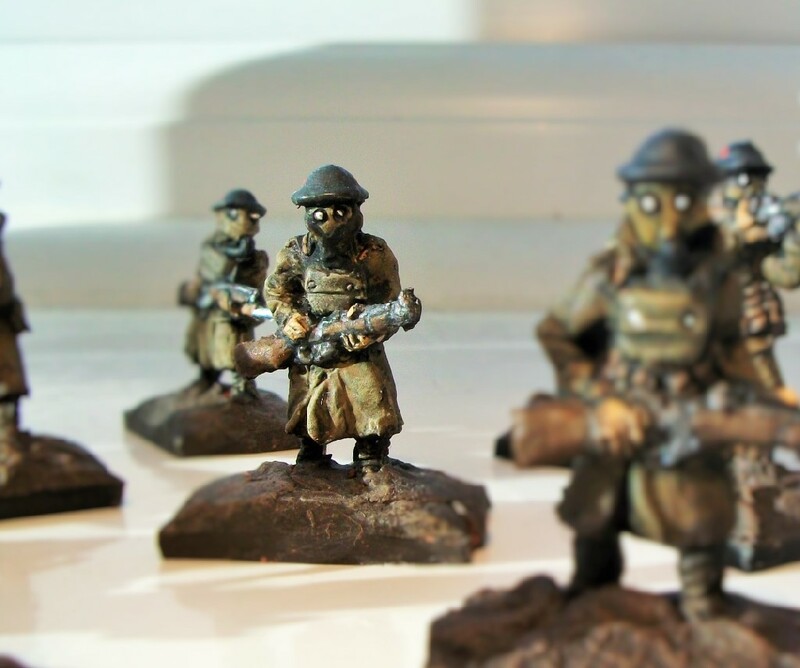 Being the only set that I know of which depicts troops in gas masks, I think Strelets have done a good job, though I know their sculpting is not to everyone’s tastes. There’s something about the facelessness of the figures with their empty, glass goggles dehumanises them, turns them into nightmarish wraiths, staggering out of the poisoned air with blank faces. They become a perfect icon of the extreme form of mass-mobilised inhumanity which industrialised warfare had brought to the world. 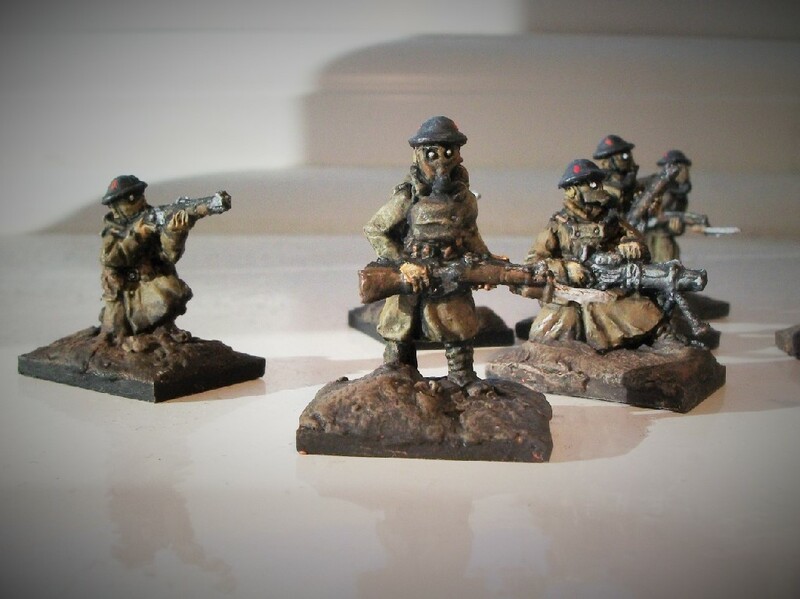 So, yes, these are the first 20th century troops that I’ve ever painted! 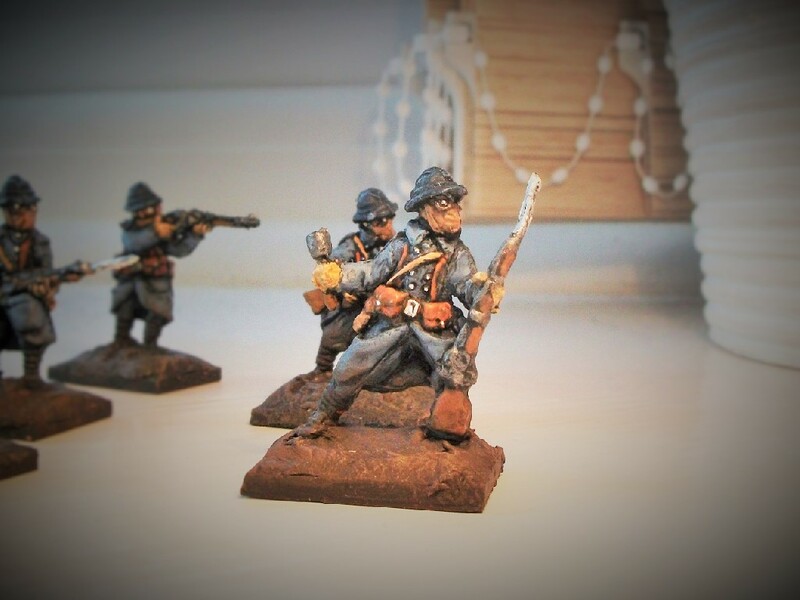 I’ve tackled the British and French infantry versions, hoping for German or other ones for Christmas and birthday (2 days later). I’ve never dealt with camouflage or drab clothing, never mind Lewis or Chauchat machine guns or gas masks. 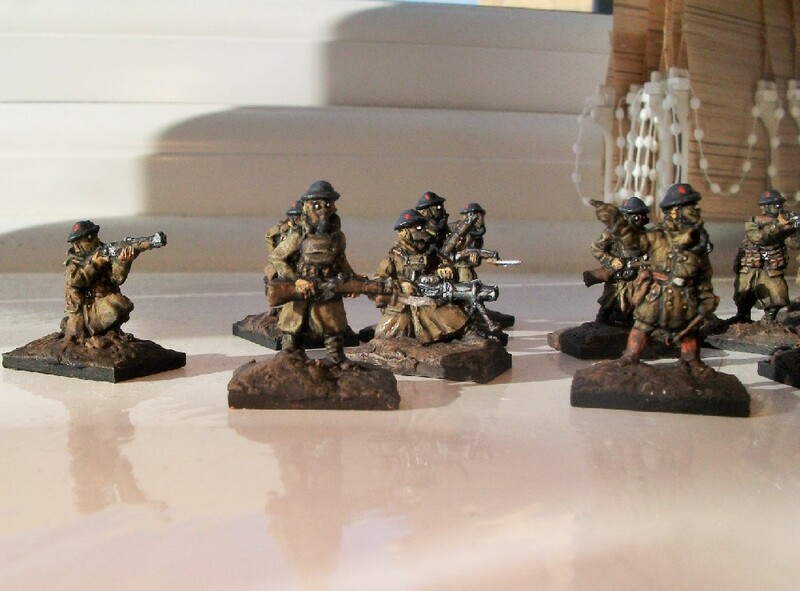 I’ve enjoyed painting them though and I like to think they look okay too. 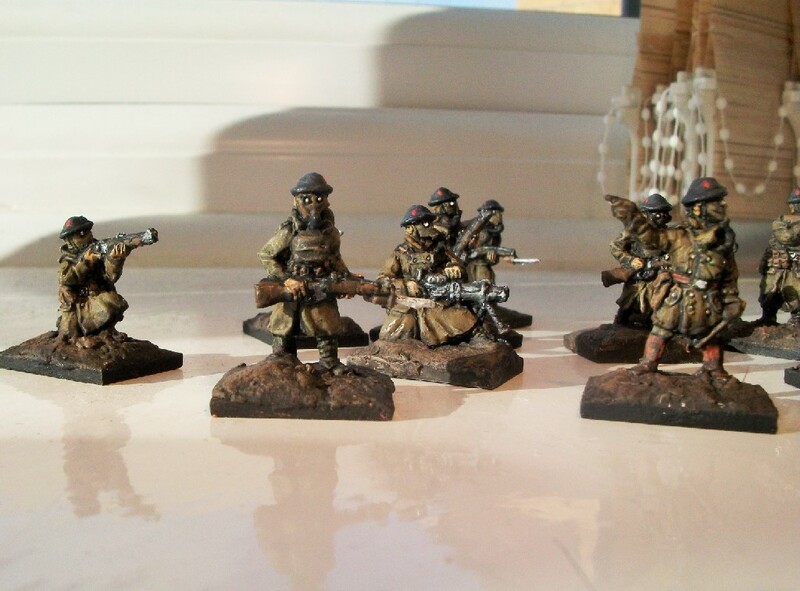 Hopefully, they may even feature on the mantlepiece this Christmas; my very own Christmas Truce vignette. 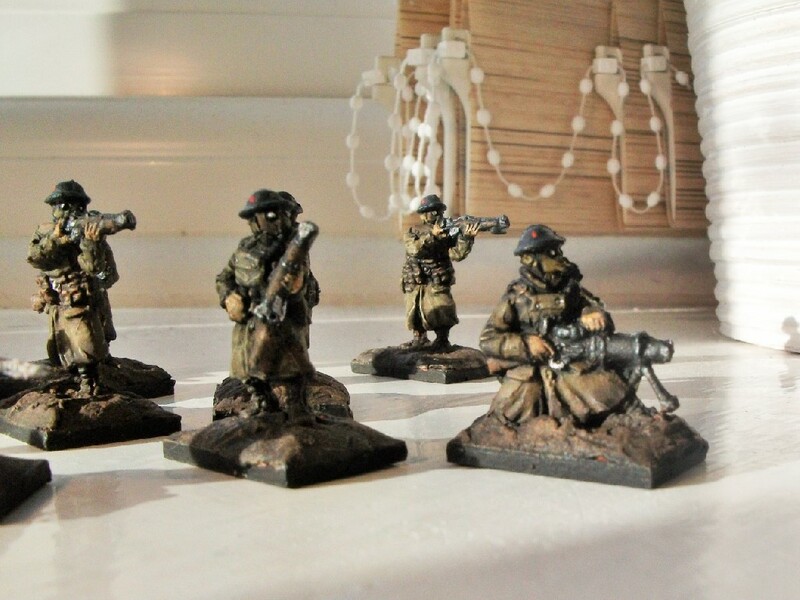 More photos of the Strelets figures to follow shortly.